There’s a new sign on the Mill Street building in Middlebury where the Vermont State Craft Center at Frog Hollow long resided. It reads, “Edgewater Gallery,” and director Peter Alpers does not want the place to be perceived as Frog Hollow II. The interior has been refreshed and partly reconfigured, and a more eclectic selection of art and crafts is given an airier, quirkier presentation. Still, the mix of merchandise — paintings, pottery, jewelry and decorative accessories — is similar to that of the late, great craft gallery. And the most mesmerizing attraction of all, Middlebury’s Great Falls, continues to rage just a few feet to the east. Alpers and gallery owner George Dorsey pay homage to Edgewater’s predecessor, which fell victim early this year to soaring debt and plummeting sales. Dorsey, a Cornwall resident who directs an international trading firm, says he decided to buy the building a few months ago because it was “such a sad sight, having that space empty for a long time.” The craft center, which opened in Frog Hollow in 1971, was a Middlebury mainstay whose loss was keenly felt, both men say. The distinction carries implications for how sales items are arrayed, he notes. “A gallery doesn’t show objects as commodities. 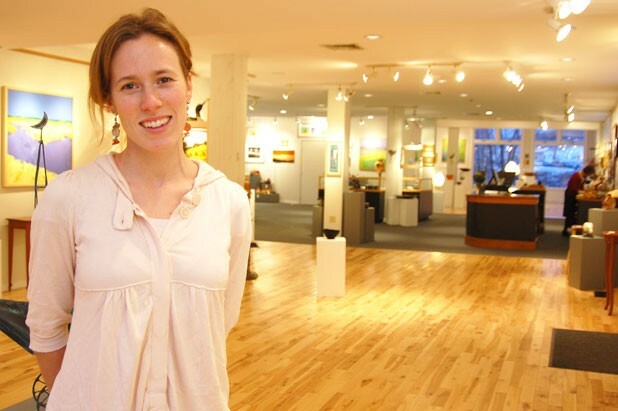 And they’re more separated from one another,” explains Alpers, who closed a gallery he had run for nine years in Andover, Mass., to take charge of Edgewater. The artists featured in the gallery’s inaugural show have a less folksy style than do many of the painters and artisans associated with Frog Hollow. And some of the most striking pieces at Edgewater — such as Ellen Granter’s elegantly spare renderings of birds and fish — were executed by artists outside the state. Indeed, some Vermont artists and artisans are represented at Edgewater. Victoria Blewer’s hand-painted photographs of barns and silos are on view, for example, along with Timothy Clarke’s classic American furniture and Tom Dunne’s turned-wood creations. Woody Jackson’s iconic paintings are in Edgewater’s catalogue, too, but the masterful prints of another Frog Hollow fixture, Sabra Field, are not. Bay Jackson, the daughter of Vermont pewterers Fred and Judi Danforth and the wife of one of Woody’s nephews, says some Edgewater browsers have asked her where Field’s prints can be found. Alpers and Bay Jackson rely on their own eyes — taking into account what the market will favor — in choosing pieces for Edgewater. Some of the artists had been in Alpers’ Andover gallery, and the locally well-connected Jackson was familiar with others. The pair shares tastes, so consensus is usually easy to achieve, Jackson says. “Who’d think a 60-year-old guy from Massachusetts and a 28-year-old girl from Vermont could collaborate so well?” she wonders aloud. Now all that remains is for Edgewater to make money — a challenge in a state where most galleries have short life spans, and in a town that is suddenly awash with art. Alpers regards the presence of three other private galleries in Middlebury not as competition but as a “synergistic” enhancement. “It makes Middlebury more of an art destination,” he reckons.